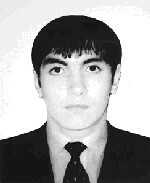 Oziev Ruslan Victorovich, 1984. kidnapped in May, 9, 2007. Oziev Ruslan Victorovich was born in December, 21, 1984, in Chermen settlement,Prigorodny district of the Northern Osetiya.Left the secondary school in Chermen settlement.Joined up the russian army from February,2004 to February,2005. Served a year and was dismissed by state of health «cardiac failure».He had no speciality and made different jobs from time to time.Having a cruel disease,he was occasionally treated. Ruslan is not married. In May, 9, 2007, Ruslan said at home he was going to see the parade in Nazran and went out at 12:00. Next day,his parents got to know that he and his friend,Arsamakov Makhmud Ahmedovich,born in 1986, left for Vladikavkaz and had not come back. Last time,they had been seen at the market «Globus»,there they talked to Ruslan’s paternal aunt-Lida.They were talking to her about 5-10 minutes and then went away. Ruslan and Makhmud were shot with the market «Globus» shooting camera. Ruslan had blue jeans,white sweater with black stripes and black leather shoes on.